Not everyone was happy with the love triangle at the center of 2015’s hottest dating sim, The Witcher 3: Wild Hunt. Fortunately, the game’s developers have been listening. Mild Spoilers For The Witcher 3 Follow. If you spend a bit of time looking around The Witcher 3’s online gathering places, you’ll see more than a few players voicing unhappiness with how some of the romance options in the game play out. Specifically, people aren’t thrilled with what happens if you have Geralt declare his love for Triss Merigold while breaking things off with Yennefer of Vengerberg. 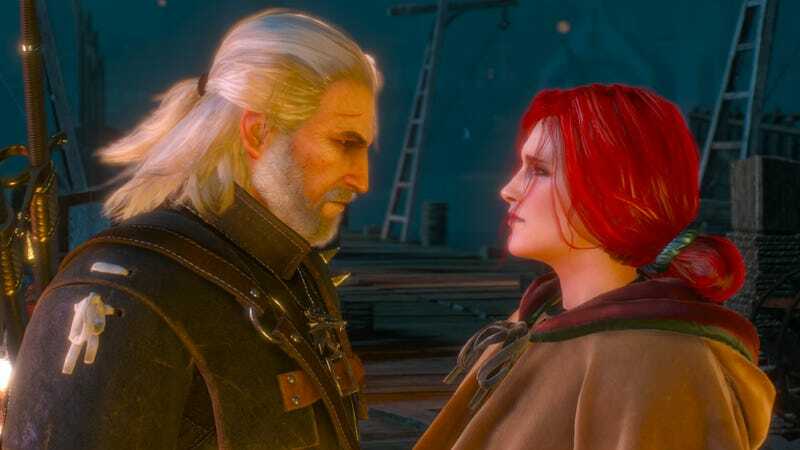 The complaint, generally, is that if you go with Triss, things can feel a bit undercooked, particularly given how many more options Geralt and Yen have to talk about their relationship and reminisce on the good old days. While you’re technically free to choose how you think Geralt should proceed, sometimes it feels like Yen is the “correct” choice, which has some members of #TeamMerigold bummed. Back in July, CD Projekt Red’s Marcin Momot said that they were were aware that people weren’t happy with some of the romance options, and were making some dialogue tweaks to improve things. A few days ago, he indicated that the tweak would go into effect in the next patch, though he didn’t say when that was coming. Still no specific date, but hey, sounds good to me! I don’t know when (or if) I’ll get around to finishing my NewGame+ playthrough, but it’s nice to know that things with Geralt and Triss will be more well-defined... if I can actually bring myself to choose her over Yen.